The multi-million selling Raspberry Pi barebone ARM-based computer now has a new iteration called the Model B+ which will be priced at £25 ($35, about AU$40). The new board is an update on the previous model and comes with more sensors and accessories. Element14, the community behind it, says that it can now deliver 1.2A over its four USB ports enough to power an external hard disk drive. There's also a 40-pin GPIO header, a microSD card slot and a better motherboard layout. The rest of the hardware remains the same. The same Beoadcom BCM2835 SoC, 512MB of RAM and a HDMI slot plus the Ethernet connector. The new design has been tweaked to consume less power (0.6A vs 0.75A) and can be powered via microUSB. 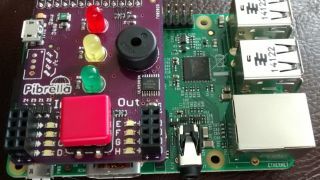 More than three million Raspberry Pi have been sold to date making it one of the most popular UK-designed computers ever. In comparison, less than two milion units of the BBC Micro - which was credited for starting the careers of quite a few programmers in the UK - were sold over its lifetime.